Trying to get Harvey to eat dinner has been one of those frustrating times when you wonder 'How can something so natural be so difficult with a toddler?'. Trying to get Harvey to eat healthy and generally eat is a bit of a mission. There have been times where you just have to go with the flow and not worry too much, but then there is a limit to how much biscuits and snacks you can give him instead of a healthy meal. Since getting Seb his own high chair, and having the boys sit together at meal time, I think has had a positive affect as Seb seems to be more interested in food now. Still not touching the food but willing to open his mouth for a few spoonful of whatever is on his menu. Just the other day he had a whole mini pot of yoghurt; a definite move forward! But he is also partial to a bit of cake or biscuits, which I am not sure is a good thing. Anyway at this stage I am just glad he is willing to try food. Having Seb at the table has also had some positive affects on Harvey. One night he was refusing to eat his mash vegetables so I started feeding it to Seb, and then on his own accord, Harvey decided he would eat mash too! Next mission is to get Harvey to eat more meat! Jack eats so well at school in front of the other kids but messes at home. He also was a good eater as a baby but thru constant sickness he just wanted easy to eat food like bananas etc. 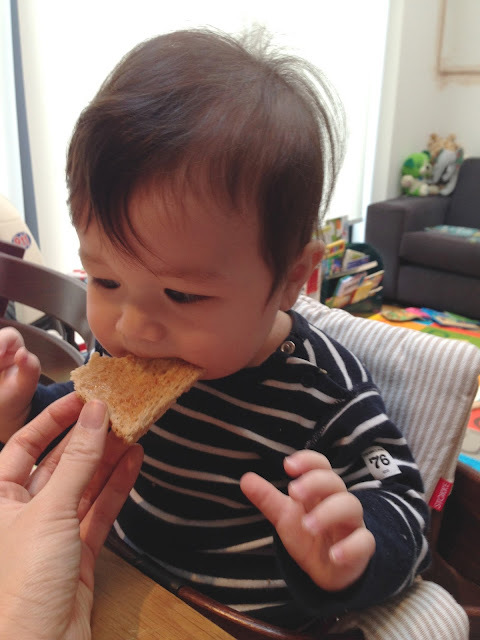 total bread & fruit addict now but we've recently found out that he loves baby corn & carrots so they accompany almost every meal. He n ow asks for whatever he wants for lunch snack & dinner!! At their age texture is a big deal & jack wont touch meat so he has a multivitamin every day & I disguise his meat or cut it reeeeeeeeeally tiny or cook turkey dinosaur things. Yeah Harvey has had a thing for baby corn and carrots lately too! I am not too worried about his vegetable intake as he does eat them but he just doesn't eat enough. I think maybe I give him too many snacks in-between meals haha. Yeah will have to really mince up the meat or funny enough big chunks that he can hold and naw on haha.